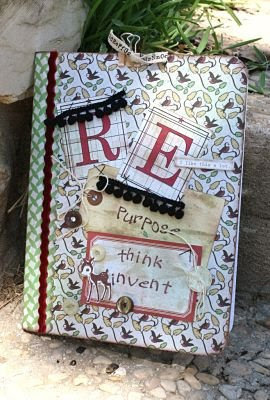 I am starting an online class July 2nd with Big Picture Scrapbooking. The class I'm taking is being taught by Jenni Bowlin. This is my notebook for the class. You can go to http://www.bigpicturescrapbooking.com/index.php and learn more about it. They have several classes being taught online. This is a trial run for me !! Back to the notebook -this is our first assignment. Keep stopping by and I will be posting my "scrappy" stuff. Thanks for stopping by!!! We got to take a class from her at Scrap Etc. this past spring. She is so much fun!! Love your notebook. Encyclopedia of Me "F & C"